For a number of reasons, bicycle sharing systems have become the new “must-have” thing for cities across the country. The success of the programs in Washington, D.C., Boston, and Minneapolis, to name a few, has set in motion plans to make bikeshare kiosks a common piece of street furniture in many more American cities. New York’s CitiBikes were unleashed this summer. The Bay Area just rolled out a program. Los Angeles, Long Beach, and Santa Monica are all looking into programs of their own, with LA running into difficulty as of late. The benefits of bikeshareing are manifest, and include commute time savings as well as health and air quality improvements. New York City makes the case for bikeshare very well here. For all of its benefits however, bikeshare has its own set of environmental justice issues. Among others, these include the process of becoming a member and how stations are located. In American cities with bikeshare, an annual membership entitling you to unlimited rides can be had for a fairly reasonable initial investment. Washington, D.C. ($75), New York ($95), Bay Area ($88), and Denver ($80) provide a few examples. In DC, if you used bikeshare to get to and from work every day, it would only cost about 14 cents per ride. This is a pretty sweet deal, but there is a catch. To sign up for an annual membership in most cities, you need to have an internet connection and a credit card. For some, these are insurmountable barriers to using bikeshare. While about 98 percent of homes in the US have access to the internet, around 60 million people do not use it. Internet use is divided along racial, age, and income lines. About 25 percent of Americans don’t have a credit card. A slightly higher percentage don’t have a bank account at all. The unbanked and those without access to the internet are those who could stand to benefit the most from access to an affordable alternative to automotive trips. What can be done to extend bikeshare access to this portion of the population? Capital Bikeshare already allows those without internet to give them a call to sign up. As part of a bike sharing program’s rollout, it would be advantageous for public officials and program representatives to call attention to computers at public libraries as portals to sign up for memberships for those without household internet access. Taking it one step further, sometimes, the issue is not one of internet access, but internet use. Some people are unaware of how to use the internet. If program representatives in their outreach efforts could personally assist those unfamiliar with the internet through the signup process, more people may be able to use the program. Alternately, rather than requiring the online purchase of a bikeshare key, programs could install machines throughout the city, similar to those for transit tickets, where you can pay for and receive a key on the spot. This would both help those without internet access use the program and also those who want to start using bikeshare immediately and don’t want to wait for their key to be delivered through the mail. The kiosk could be similar to the one Washington D.C.’s Metro already has for purchasing transit passes. The credit card issue presents a challenge that requires some creativity to overcome. A credit card is required to sign up because keeping a bicycle for too long results in additional fees. One potential workaround would be some sort of prepaid option. Similar to putting prepaid minutes on a cellphone, users could purchase a membership with cash or check, and then add additional money onto their key to pay for any extra fees they rack up by keeping bikes longer than 30 minutes. When the additional money has been spent, the user would be notified to add more. No credit card would be needed. In Los Angeles, BikeNation has said that they are looking into offering prepaid cards, but it’s unclear if they would be for annual or just daily memberships. Capital Bikeshare has a signup option for users without a credit card to be a co-subscriber on another user’s account, but this isn’t ideal. Helping overcome the obstacles of internet use and credit card ownership would open the mobility benefits of bikeshare to a greater population, one that stands to benefit tremendously. Capital Bikeshare has taken strides to minimize these barriers to use of its service, but it can do more. Other bicycle sharing systems should take note of what Capital Bikeshare done and where improvements can be made. The other social justice issue is one of station placement. While most bike sharing systems rely on extensive community input about where stations should go, stations can often be located in areas that don’t equitably serve the entire community. 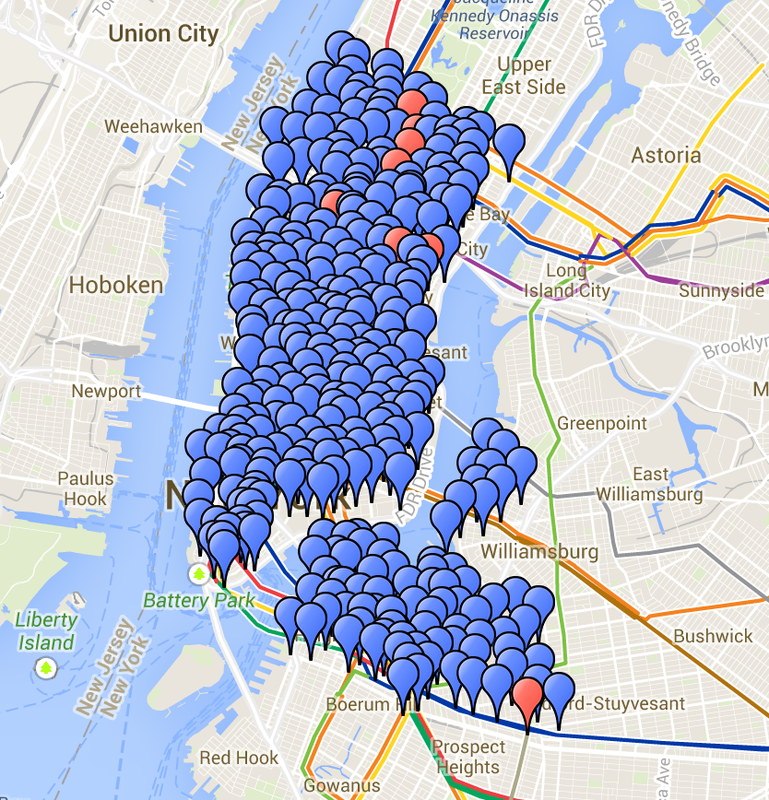 The current station placements of the Citibike program in New York come to mind. No Queens. No Harlem. No Bronx. No Staten Island. Most of Brooklyn is left out. NYCDOT has indicated that initial stations were placed in these areas because the high density and number of visitors were expected to produce strong ridership. Boroughs like the Bronx and Queens have poorer transit access and generally lower incomes, which means that they could potentially get greater use out of bikeshare than the more affluent Manhattanite or brownstone Brooklynite. Bikeshare becomes another amenity that separates the haves from the have-nots. A similar issue took center stage in the Sacramento area last month when West Sacramento mayor Christopher Cabaldon and a bikeshare strategist debated station placement on Twitter. The discussion was summed up nicely by the Sacramento Bee. The initial plans that the [Sacramento Metropolitan Air Quality] district showed to stakeholders and elected officials called for the program to begin with kiosks in areas with a heavy concentration of bike riders: the grid, East Sacramento, Land Park and Davis. Those areas also happened to be largely affluent and white, and Cabladon believes the program should start with a more diverse user base. Those deciding station placement would surely like to extend the network far and wide, but they are constrained. They need to prove that the bikeshare concept will work. People need to use it so planners can show politicians and naysayers that the program is successful. This translates to placing stations where ridership is likely to be higher, which, as can be seen in the Sacramento and New York examples, tends to be more affluent, Caucasian places. Cabladon hypothesized that the bias toward these areas was the result of planners generally not thinking of working class individuals as bike riders. This is a larger issue that leads to questions asked of transit systems as a whole. How do you measure success? Is it number of rides? Is it number of people served? Is it the socioeconomic status of people served? Is it the geographic service area? While there is no definite answer, taking into account areas of poor transit access and lower socioeconomic status when placing stations will lead to a more equitable bike sharing network. Improved equity in station location and lowered barriers to bikeshare membership will both ensure that those communities who stand to gain the most from the program will be able to do so. It’s rare that something so simple can benefit so many in so many ways, but bikeshare has the ability to do just given the chance.